Hong Kong (CNN) Taiwan has accused China of “reckless and provocative” action, after two Chinese air force jets crossed a maritime border separating the island from the mainland. The island’s military scrambled fighter planes after it said two Chinese J-11 fighter jets crossed the border within the waters of the Taiwan Strait, known as the median line, at about 11 a.m. on Sunday. If confirmed as intentional, the Chinese incursion would be the first of its kind in years, said Bonnie Glaser, director of the China Power Project at the center of Center for Strategic and International Studies. She said there was one instance in 2011 when Chinese planes accidentally crossed the line. According to local Taiwan media, the Sunday incident triggered a 10-minute standoff between jets from the two sides. China and Taiwan have been separately governed since the end of a brutal civil war in 1949. Beijing views the self-governed island as part of its territory. On Saturday, the Japanese Self-Defense Force announced it had also scrambled fighters after the Chinese air force flew between Japan’s islands of Okinawa and Miyako. Japan’s Self Defense Forces said in a statement the Chinese air force had sent four Xian H-6K long range bombers, one Shaanxi Y-8 electronic countermeasures aircraft, one Tupolev Tu-154 MD electronic intelligence plane and at least two fighter jets through international airspace between Japanese islands on Saturday. In the past 12-months China’s military has ramped up the number of drills and exercises it conducts around Taiwan, including sailing the aircraft carrier Liaoning through the strait. In a speech in January, Chinese President Xi Jinping said Taiwan independence was a “dead end,” warning he didn’t rule out force as a method of reunification. Speaking on Wednesday, Taiwan President Tsai said her government had submitted a request to buy new F-16 fighters and M1 heavy tanks from the United States, which she said would “greatly enhance” the island’s defense capabilities. “We will strive for peaceful reunification with utmost sincerity and greatest efforts. However … we will take all necessary measure to safeguard national sovereignty and territorial integrity and protect peace and stability across the strait,” he said. 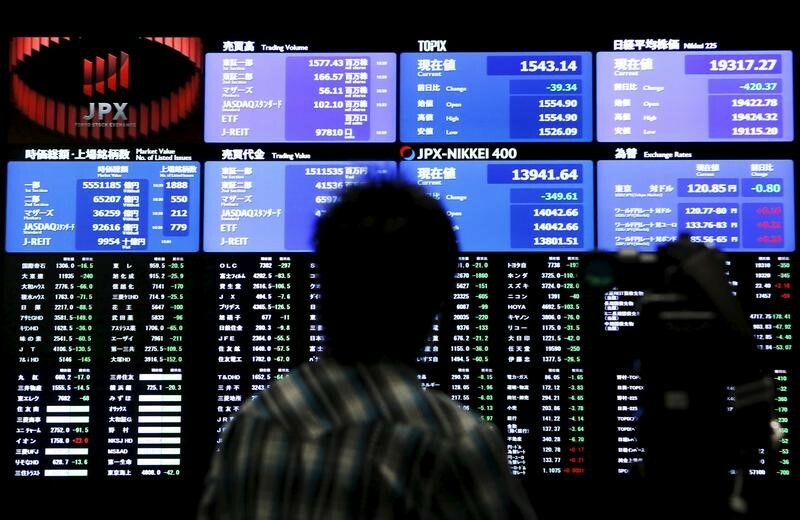 TOKYO (Reuters) – Asian stocks powered higher on Monday as positive Chinese factory gauges and signs of progress in Sino-U.S. trade talks boosted sentiment, although another defeat for British Prime Minister Theresa May’s Brexit deal added to sterling’s woes. Spreadbetters expected European stocks to open higher, with Britain’s gaining 0.4 percent, Germany’s adding 0.8 percent and France’s rising 0.9 percent. MSCI’s broadest index of Asia-Pacific shares outside Japan added 1 percent and the rallied 2.4 percent. Australian stocks climbed 0.6 percent, South Korea’s gained 1.3 percent and Japan’s advanced 1.4 percent. The markets took heart after China’s official purchasing managers’ index (PMI) released on Sunday showed factory activity unexpectedly grew for the first time in four months in March. A private business survey, the Caixin/Markit PMI, released on Monday also showed the manufacturing sector in the world’s second biggest economy returning to growth. “Our view is the impact of policy easing is gradually kicking in, pushing up sequential growth indicators such as PMI first,” wrote China economists at Bank of America Merrill Lynch (NYSE:). The United States and China said they made progress in trade talks that concluded on Friday in Beijing, with Washington saying the negotiations were “candid and constructive” as the world’s two largest economies try to resolve their drawn out trade war. “The ongoing U.S.-China trade conflict has provided a steady stream of conflicting signals for the markets. But as a whole the negotiations appear to be headed towards a conclusion,” said Soichiro Monji, senior strategist at Sumitomo Mitsui DS Asset Management. In the currency market, the against a basket of six major currencies stood at 97.147 after going as high as 97.341 on Friday, its strongest since March 11. Sterling took its latest knock after British lawmakers rejected Prime Minister May’s Brexit deal for a third time on Friday, sounding its probable death knell and leaving the country’s withdrawal from the European Union deeper in turmoil. The pound crawled up 0.15 percent to $1.3055 having posted three sessions of losses. The Australian dollar advanced 0.35 percent to $0.7122. The is sensitive to shifts in the economic outlook for China, the country’s main trading partner. The euro rose 0.2 percent to $1.1239 while the dollar gained 0.2 percent to 111.035 yen. The benchmark edged up to a six-day high of 2.444 percent, pulling away from a 15-month low of 2.340 percent brushed on March 25. The Treasury 10-year yield had sunk as the Federal Reserve halted its drive to hike rates and as risk aversion, driven by concerns about a global economic slowdown, gripped financial markets towards the end of March. The slide had pushed the 10-year yield below the three-month rate for the first time since 2007 late last month. This phenomenon – when the spread between short- and long- dated yields turns negative – is known as a curve inversion and has preceded every U.S. recession over the past 50 years. The 3-month/10-year yield spread has since pulled back from negative territory and stood around 3 basis points. prices added to Friday’s gains, with U.S. West Texas Intermediate (WTI) futures gaining 0.6 percent to $60.52 per barrel. October 12, 2016: A a Chinese worker making soft toys at a factory in Lianyungang, Jiangsu province.